Our live blog from Routes Europe 2019, featuring the latest news, interviews, images and videos from the event. Follow our live blog for updates throughout Routes Europe 2019, bringing together more than 1,200 delegates in Hannover. 16.00 - Baton passed to Bergen! 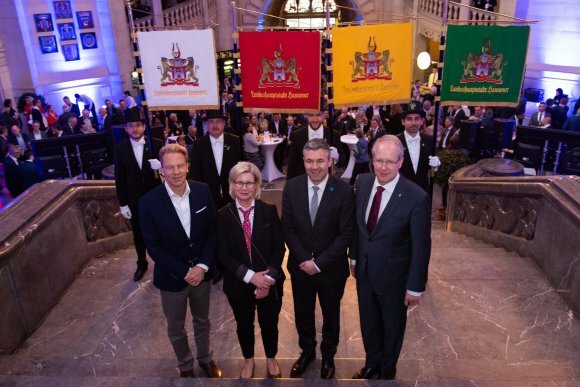 As Routes Europe 2019 comes to an end, this year’s hosts in Hannover passed the baton to Avinor, which will host the event in Bergen, Norway in 2020. Routes Europe 2020 will be hosted by Avinor, which own and operate 43 airports across Norway. Avinor has taken a leading role in reducing climate gas emissions from the aviation industry, including the development of electric aircraft and supplying sustainable jet-biojetfuel, and they are keen to foster conversations around sustainability throughout the event. Speaking from the handover ceremony at Routes Europe 2019, Steven Small, brand director of Routes, said: “We are very proud to be working alongside Avinor to bring Routes Europe to Norway for the first time. The event will be an unprecedented opportunity to show the aviation industry what Bergen, and Norway, have to offer." Known as the ‘Gateway to the Fjords’, Bergen is an intimate city that will allow for the event to be fully integrated within its surroundings, with the venue, official hotels and reception venues all easily accessible. The 15th route development forum for Europe will take place 27 - 29 April 2020. Milan Malpensa has been attending Routes Europe this week, fresh from the news of the airport’s 4-star Skytrax rating. Skytrax, one of the world’s leading airport quality certification bodies, proposes a ranking based on an on-site audit, which took place in October 2018 at Malpensa Terminal 1. It considers almost 400 items deemed important to the traveller experience. Malpensa Airport stood out in particular for its high levels of quality in terms of assisting passengers and keeping them informed, as well as for the accessibility and efficiency of the security check areas. The attractiveness of its commercial areas was also noted following a major restyling in 2015. The stylistic choices of the airport’s rooms and lounges were also praised in the assessment. Milan is the host and destination for the 26th World Route Development Forum in 2020. 13.30 - View the image gallery! With more than 1,200 delegates, 100 airlines, 300 airports and 50 tourism authorities engaging in 4,800 face-to-face meetings over the course of three days, Routes Europe 2019 has been an amazing event!. Check out some of the best images from the past three days on Facebook. An additional two million air trips will be made during the UEFA Euro 2020 football tournament, presenting opportunities for airlines and airports alike. That was the message from Thomas Perrot, the mobility manager for Europe’s football governing body UEFA. Speaking to delegates, he said the organisation expects more than two million passengers to board a flight during the month-long competition in June 2020. To mark the 60th anniversary of the competition, the UEFA Euro 2020 Final Tournament will be played in 12 countries across the continent. The tournament includes 24 national teams playing a total of 51 matches with three million tickets expected to be sold. “It’s a big opportunity for airlines to launch new routes and link host cities, as well as increasing frequencies on existing services that will be popular with supporters,” said Perrot. 11.00 - Highlights from Day Two! Increasingly adventurous Chinese tourists are helping drive Finnair's route development. 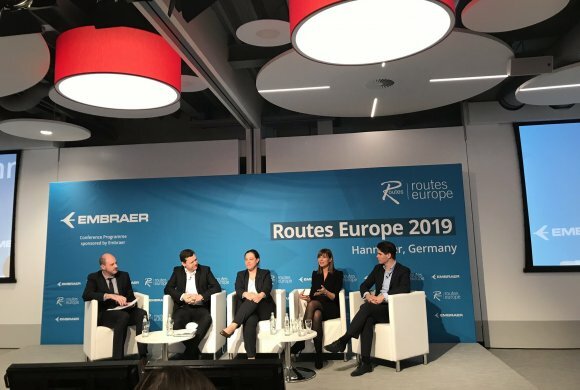 Speaking on a panel debate, the airline's vice president traffic planning Rikke Munk Christensen said as the Chinese visit Europe more, so they are becoming increasingly keen to explore destinations off the beaten track. She added this has helped drive new routes for the airline, including a year-round route to Trondheim in Norway set to launch in June this year. She added to cope with the changing demographic and encourage it further the airline had started offering a payment service via the Chinese platform Alipay. It has been five years since more than 1,200 aviation professionals gathered in the southern France port city of Marseille for the ninth Routes Europe. Since then, the city’s airport has enjoyed strong growth with passenger traffic topping nine million for the first time in 2017. 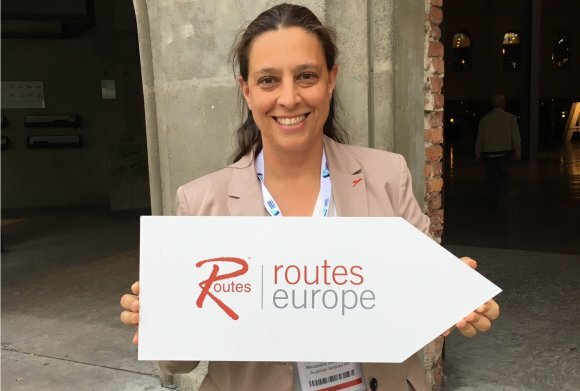 “In the year following Routes Europe, Marseille Provence Airport welcomed two new airlines, Volotea and Eurowings, as well as a number of new routes launched by easyJet and Vueling,” says Véronique Lemée-Alexandre (pictured), the airport’s head of market research and route development. A total of 21 new routes were opened in 2018, helping passenger numbers grow by 4.3 percent year-on-year to 9.39 million. International traffic - which accounts for 61 percent of traffic from the airport - surged by 6 percent. According to figures provided by OAG Schedules Analyser, Volotea added more than 53,000 departure seats in 2018, compared with 2017, while Vueling, Lufthansa and Air Austral also grew at impressive rates. This year has also got off to a strong start. Low-cost giant Ryanair is to base two Boeing 737-800 aircraft at MRS in the coming weeks, flying more than 40 routes this summer. New destinations from Marseille will include Agadir, Alicante, Bologna, Bucharest, Budapest, Manchester, Naples, Prague, Stuttgart, Ouarzazate, and Warsaw to name a few. The carrier has also confirmed it will base a third aircraft at Marseille Provence this winter and open seven additional routes. 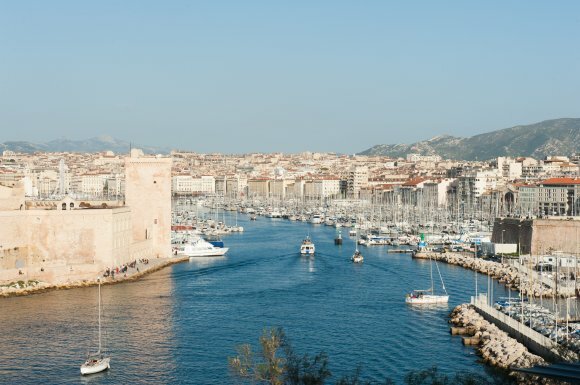 Read more about Marseille's impressive growth. 08.15 - Day Three gets underway! 21.30 - “For us this means the world"
Kam Jandu, chief commercial officer of Budapest Airport, said: “When you invest in your marketing strategy and you invest in a great team who fly around the world to meet with airlines and attend the Routes conferences, it’s fantastic that the airlines take notice of that and recognise what you’re trying to achieve. Budapest Airport has been named the overall winner after winning the 4-20 million passengers category.The airport’s passenger traffic has increased by double digits over the last four years with 2018 recording a rise of 13.5 percent. A total of 18 new routes, including 12 new destinations, were launched between April 2018 and April 2019. They include direct flights to Philadelphia with American Airlines and to New York JFK, Chicago and London City with LOT Polish Airlines. Fifteen new routes have already been announced for 2019, the highlight being service to Shanghai operated by Shanghai Airlines. Billund Airport, who took home the award for an airport under 4 million passengers were congratulated for a ninth consecutive year of growth in 2018, passing the 3.5 million passenger mark for the first time in its history. New destinations added last year included Athens, Bergen, Lisbon, Vienna and Warsaw, while LOT Polish Airlines and Widerøe commenced service. As the town of Billund is too small to support any direct air services, the airport’s marketing strategy has focused on positioning it as the gateway to west Denmark and a catchment area of seven cities. In 2018 more than 40 airline meetings and site visits were arranged, resulting in nine new routes for 2019, 21 new weekly flights on five existing routes, and a new Norwegian base. Billund Airport has invested €6m in incentives to support new routes and capacity increases, with 20 out of 23 scheduled airlines growing their presence in 2018. The award for an airport with over 20 million passengers was won by Athens International Airport. More than 24.1 million passengers used Athens International in 2018, a rise of 11 percent compared with the previous 12 months. The airport secured 62 new routes during the period and welcomed four new airlines. Volotea and Ellinair opened bases, while Ryanair started 21 sectors and Aegean Airlines commenced 15 new routes. Thirteen carriers also added capacity across 34 routes. Last year, the airport’s airline development team took more than 70 flights and delivered in excess of 100 presentations. These efforts have resulted in 37 new services so far in 2019, including 12 new destinations such as Chicago and Muscat. Athens’ incentive scheme comprises 13 different elements, covering any possible type of route development from home-based airlines, LCCs or visiting carriers. To help ensure routes are sustainable and profitable, the airport also spent €3.5m on marketing support in 2018. The destination marketing award was won by Vienna Tourist Board. Vienna exceeded 16.5 million overnight stays for the first time ever in 2018, a rise of 6.3 percent compared with 2017, while total arrivals grew by 6.2 percent to 7.5 million. Air service development forms part of Vienna Tourist Board’s Tourism Strategy 2020, which outlines an objective of securing 20 new international flight connections and that target has already been met, two years ahead of schedule. In 2018, the tourist board carried out marketing activities with 23 airlines, including hosting a gala dinner to promote the new Shenzhen-Vienna flights with Hainan Airlines, and organising business breakfast for selected media and trade partners. In 2019, three new direct routes that are expected to drive significant incoming tourism to Vienna have already been confirmed. 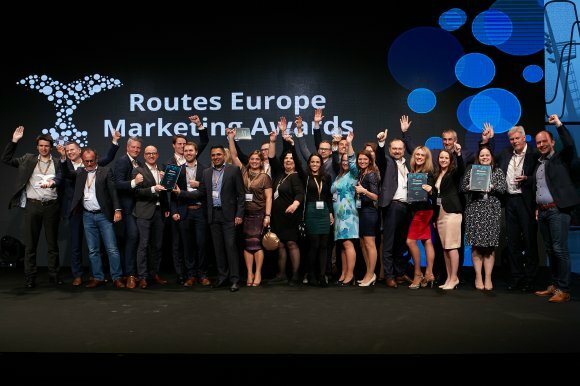 Budapest Airport will go through to compete for the title of overall winner at the World Routes Marketing Awards which will take place in Adelaide on the 23rd September. 19.00 - Networking Evening and Marketing Awards about to start! Kalaallit Airports has called for bids for the completion of runways and other construction work for the two new major airport extensions in the capital of Nuuk and the award-winning tourism hotspot of Ilulissat, home of the UNESCO World Heritage Site, the Ilulissat Icefiord. A strong team of pre-qualified construction companies and joint ventures, represented by strong and experienced field players from Canada, China, Denmark and the Netherlands is now working on the bids, which must be submitted by the end of May in order to initiate construction later this year. 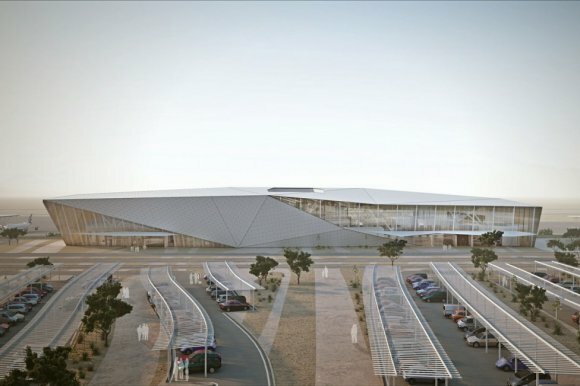 The runways of both airports will be 2,200 meters long – and will be complemented by totally new terminals, service buildings, facilities etc., ensuring that both airports will present themselves as very attractive destinations for travelers, tourists and operators alike upon completion in 2023. A call for bid for construction of the smaller South Greenland airport of Qaqortoq is expected next year. Find out more from Jákup S. Kass , non-executive board member of Kalaallit Airports, at Routes Europe. 15.30 - Did you know? 15.00 - View the highlights from Day One! 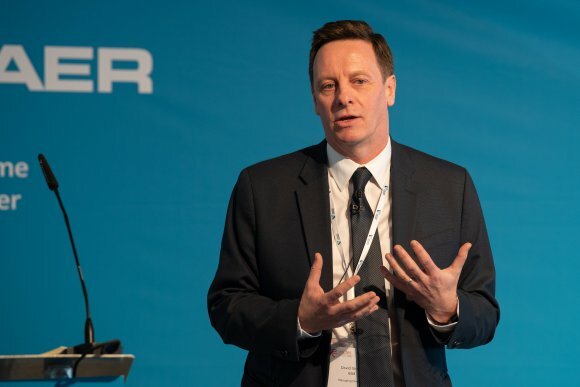 German leisure airline TUI fly has sufficient spare capacity in its schedule to cope with air-traffic control related disruption this year, its managing director has told delegates at Routes Europe 2019 in Hannover, but he expects it to be another difficult summer. In a wide-ranging interview, Oliver Lackmann also stressed that Boeing and its airline customers will need to work together if they are to win back passenger confidence in the 737 MAX 8 aircraft, and he confirmed that TUI fly will take four 737 MAX 10 aircraft by 2023. Lackmann said the carrier planned to have 39 aircraft this summer - four of which were due to be the MAX 8s - but it will instead have 38. Replacing the MAX 8s will be leased aircraft, plus one of its own that was due to be put into storage. TUI Group warned in March that the grounding of Boeing 737 MAX aircraft could cost it up to €300m. In an update to investors, it said it would take a €200m hit should the jets be grounded until mid-July. However, if mid-July proves to be an unrealistic date, TUI plans to extend the measures it is taking until the end of September, costing it a further €100m. The group has a fleet of about 150 aircraft, including 15 of the grounded MAX 8 jets. TUI fly received its first 737 MAX 8 on the same day of the grounding. Lackmann admitted that Boeing has much work to do to restore passenger confidence, but said airlines also need to work hard to win back trust. 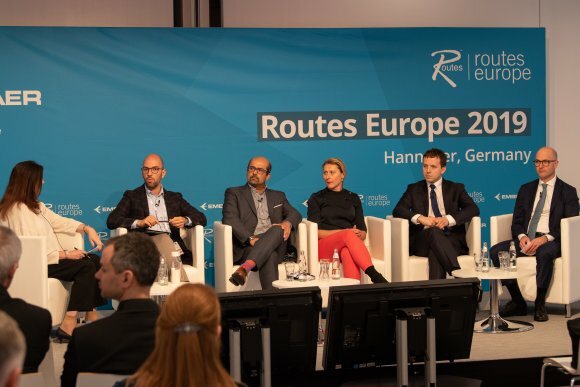 A panel of European airline and airport senior representatives discussed the changing environment at the Routes Europe conference in Hannover on 9 April 2019. They noted how fast things have changed, with several European airlines failing and competition reaching fever pitch on some routes. Airports like Vienna have experienced dramatic changes with the arrival of LCCs and the rapidly altering situation of NIKI, which became LaudaMotion that is now a Ryanair subsidiary. Even though timing and conditions of Brexit are unclear, as is its impact on air transport regulation, UK airports and airlines say they are already feeling substantial negative effects on their business. Jens Flottau reports. 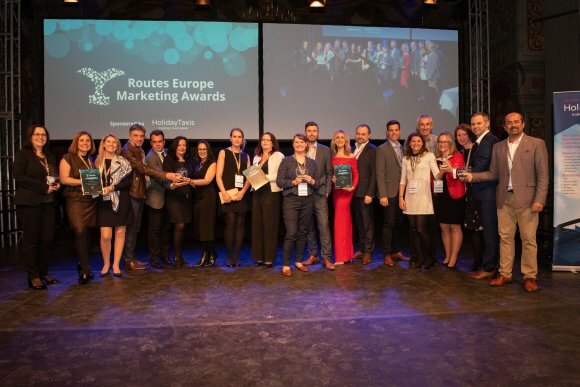 The Routes Europe Marketing Awards recognise the outstanding marketing support that airports and destinations provide to their airline partners. Airlines are asked to nominate organisations based on the marketing services that have supported the successful launch of new routes or the development of existing ones over the past 12 months. Unlike most airline executives, TUI fly’s managing director Oliver Lackmann is as comfortable in the cockpit as he is in the boardroom. Routesonline spoke to him ahead of his participation at Routes Europe 2019 in Hannover. He took his first flying lessons when he was 28 and became a commercial pilot back in 2000. He began his career at Augsburg Airways and then spent 14 years in various roles at Air Berlin, before becoming managing director of its Austrian subsidiary NIKI in April 2016. 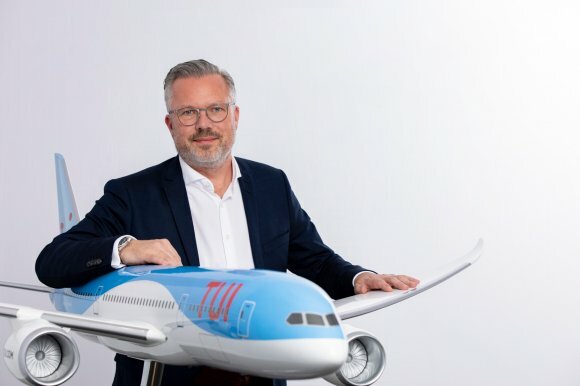 Following the group’s well-publicised demise, Lackmann joined German leisure carrier TUI fly just over a year ago as chief operating officer and was named managing director last November. However, he has just renewed his licence for the Boeing 737 and expects to be a regular in the cockpit. While passengers may have no idea who their flight captain is, he explains that the experience of flying aircraft will enable him to gain a valuable understanding into how the carrier operates. Read the full interview and join us at 09.30 in the Keynote Theatre to hear more from Oliver. 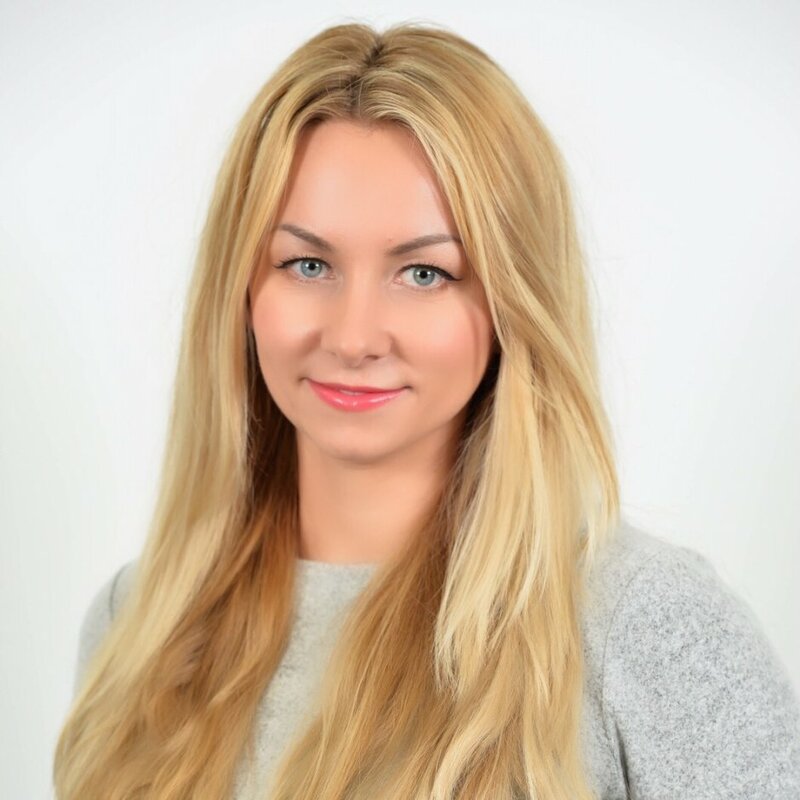 Ahead of her participation in the Routes Europe 2019 Conference Programme, Routesonline spoke to Ilona Cambron, director air service development at ASM Americas, to find out more about how catchment and leakage data can massively improve an airport's pitch to an airline. What is catchment and leakage as it relates to an airport? Obviously there are a lot of airports out there. To justify new service there are two avenues to prove the market to an airline. You can argue for stimulation, that the market will grow with the airline adding service. You can also argue for share shift from a nearby airport with existing traffic. The latter requires an analysis of your catchment and how much traffic is leaking between airports. Both of these traffic justifications represent risk for an airline in terms of determining what passengers will do. Anything that makes that analysis more rigorous and less of a guess improves your pitch. How does this catchment and leakage data improve an airport’s pitch to an airline? Well, the data used to determine where passengers live and what airport they fly out of has been pretty limited up until now. There are a few sources, but the data has been locations of travel agents and in some cases credit card billing addresses, but nobody has created a product that takes the data and fills in all the gaps. This new product offers data by postal code with 100 percent traffic coverage and at a pretty detailed level while still respecting data privacy limits. Find out more about the importance of catchment and leakage data and how airports can use it to their advantage. 07.45 - Day Two is underway! 17.00 - Join us in Adelaide! Key decision makers from the Basque Country are in Hannover this week to further build on the work started when the region hosted Routes Europe a year ago. In April 2018, about 1,200 delegates descended on Bilbao for the 13th annual route development forum for Europe, which was hosted by The Basque Government, The Provincial Government of Biscay and Bilbao City Council, with the support of Aena. Since then, much work has been done to secure new routes to the region and bring in additional airline partners. 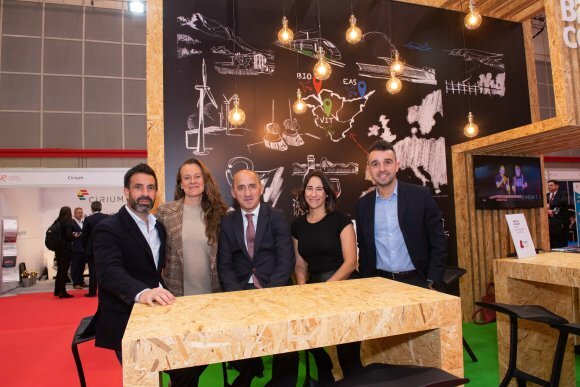 Speaking to Routesonline, Basque Tour’s MICE and city breaks product manager Maitane Tocino said the region’s strong ethos of partnership is starting to pay dividends as the momentum of hosting Routes Europe 2018 continues. Tocino added that the Basque Country’s three airports - Bilbao, Vitoria and San Sebastian - are very complementary. Ignacio Casas Muro, executive manager at Bilbao Air, the organisation set up to promote Bilbao Airport, agreed that Routes Europe 2018 helped to foster a united approach among all the region’s key travel and tourism stakeholders. Alex Goldschmidt and I’m senior director network management for Austrian Airlines. I love the complexity of bringing together operative and commercial requirements in order to build the best possible flight schedule which does meet our customers´ expectations. Challenges I do see mostly (and difficult to influence) in external factors, such as infrastructure issues (ATC) and weather. The growing LCC competition in Vienna has been a challenge in the recent months and will continue to be. The pioneers of flying who did the most adventurous and dangerous part of it all more than a century ago! I am a passionate Ultimate Frisbee player for more than 20 years – and keep on playing in the Masters division. My next big event is the European Beach Championships in May in Portugal, where I will be representing Austria with my teammates from Austrian Mixed Masters. My son and I love to do Pokemon Go hunts. Alex will be taking part in the Consolidation and Competition Panel Debate at Routes Europe 2019. 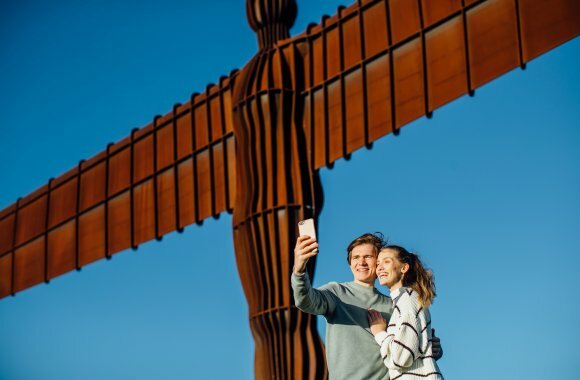 Newcastle International Airport has launched a new inbound tourism website for the North East of England, which aims to increase the number of visitors to the region. The website, which is branded Visit North East England, follows the themes of ‘uncover’, ‘explore’ and ‘experience’. It features videos, written content and photographs and will be translated into a number of different languages – beginning with Chinese Simplified, Spanish, French, German and Dutch over the coming weeks. Future developments under consideration are bookable product for many of the local tourism attractions, as well as interactive mapping of the region. Jen Rea, the airport’s newly appointed inbound tourism manager, said: “I am very passionate about promoting the North East, as I strongly believe that the inbound tourism project will be of great benefit to the whole of our region. Newcastle Airport chief executive Nick Jones added: “The tourism project is set to be hugely beneficial to the region by increasing the number of visitors coming to the North East through ‘Your Airport’. 14.00 - Pick up your copy of Routes Show News! There are still reasons to be cheerful about the European aviation market, despite a number of potentially damaging issues on the horizon, ranging from further airline consolidation to Brexit. 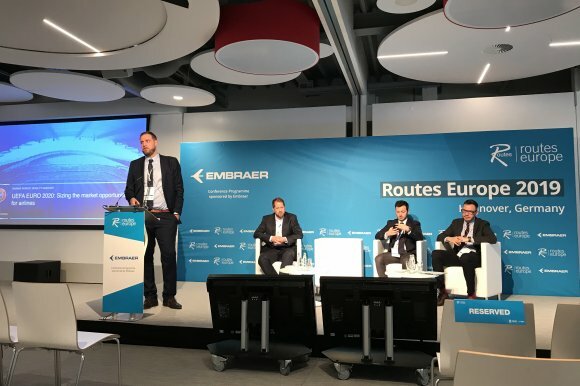 Speaking at the opening of Routes Europe 2019 in Hannover today, ASM managing director David Stroud said 600 million additional passengers are expected to take to the skies in the next 20 years across the continent. He said much of the growth will be met by the 287 European airports which are currently investing in capacity increasing projects while Europe’s airlines have 3,133 aircraft on order with options on a further 686. Stroud added there have also been as many as 752 new routes launched in the continent since September last year. “Whatever headwinds we face, this looks like a vibrant market where there’s still a lot of energy and a lot of things going on,”he said. Stroud argued consolidation could have a major impact on Europe’s airlines, especially with 37 percent of the European market being operated by non-major airlines, compared to 14 percent in the US where much of the market is operated by a few core airlines. Tallinn Airport in Estonia will remain a key focus for airBaltic this year as the airline prepares to grow its fleet by up to 80 A220-300 aircraft by 2024. 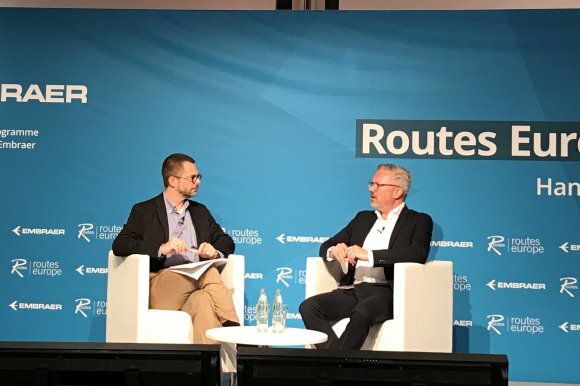 Speaking to delegates at Routes Europe 2019, the airline’s SVP network management Wolfgang Reuss outlined the Latvian flag carrier’s future network plans, as well as its explaining why it does not plan to join an airline alliance. In February 2019, airBaltic carried more than 35 000 passengers to and from Tallinn Airport, making it the number one airline at the airport. From the base, it offers direct flights to Amsterdam, Berlin, London, Oslo, Paris, Stockholm, Vienna and Vilnius as well as connections via Riga. The airline will launch new direct services from Tallinn to Malaga, Brussels and Copenhagen in early June. In addition, airBaltic has announced its 13th destination from the Estonian capital to Salzburg, Austria. Winter seasonal flights between the two cities will commence on 21 December 2019. Addressing the issue of whether airBaltic plans to join an airline alliance, Reuss said that carrier gains more value from making bilateral agreements on a route-specific basis. airBaltic welcomed its 16th Airbus A220-300 jet in late March, with six more to join its fleet by the end of the year. It comes as the carrier plans to end its Boeing 737 fleet operations in autumn 2019, one year ahead of originally planned. Reuss said that having a single aircraft type in its fleet would minimise complexity and boost efficiencies, enabling it to maintain its profitability. airBaltic, which scooped the ATW Market Leader award at the recent ATW Airline Industry Achievement Awards in New York, has 50 firm orders for the A220-300 with a further 30 options. 11.30 - Make sure you visit our World Routes hosts! 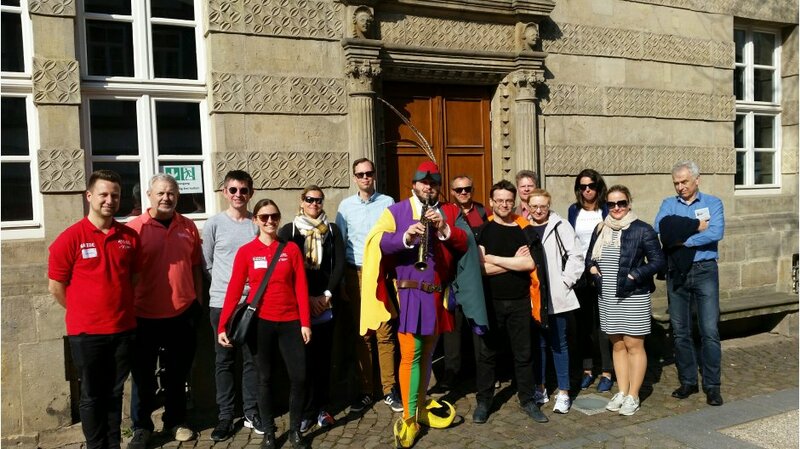 Routes' brand director Steven Small has officially opened Routes Europe 2019, outlining why Routes is taking place in Hannover as well as what delegates can expect over the course of the event. 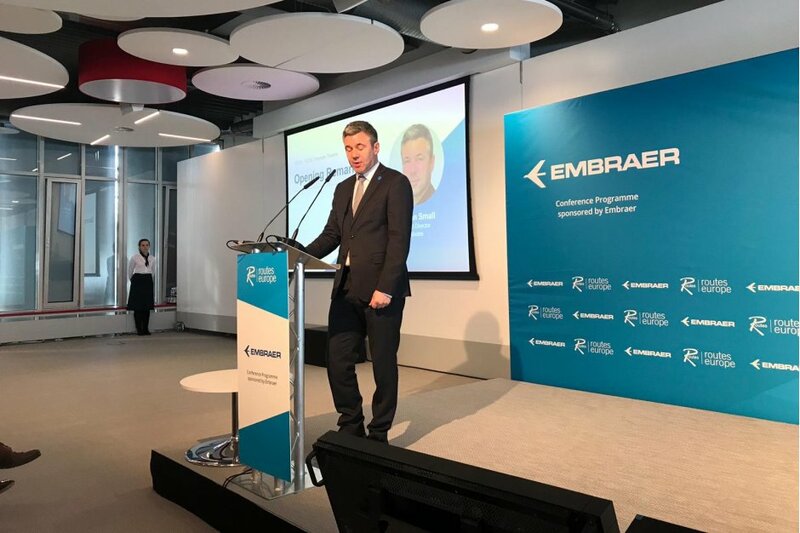 He said: "Although it’s one of the most mature global aviation markets, with less growth than some of the other locations we hold events, Europe remains an absolute powerhouse in global aviation. "It’s also a market where change continues to happen at a rapid pace. Just a few weeks ago we sadly saw the final flights of WOW, one of the most ambitious airlines on the continent. "There has been a constant theme of consolidation and fluctuation in the European market in recent years, and new aircraft technology could completely alter the traditional travel patterns. "Which is why it’s more important than ever that we get together as an industry as often as possible to discuss what the future holds. "The meetings, relationships and decisions made at this event over the next few days will shape how that evolves. All of you here, together, are making connections that will change the future of the world’s skies forever." 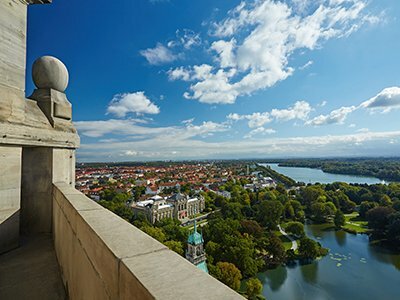 “We’re delighted that Hannover’s time to host Routes Europe has arrived. It’s a fantastic exhibition and I’m sure will be a huge success. We’ve already had some amazing feedback from delegates enjoying the city,” Dr Raoul Hille, chief executive of Hannover Airport, told Routesonline. “Hannover is not the capital Berlin or a mega-hub like Frankfurt. We are a medium-sized city, but one with fantastic potential. It’s our aim to showcase the core strengths of the region so that airlines will recognise the ambition we have and add new routes or increase frequencies on existing ones. 10.00 - Meetings about to start! 08.00 - Today's the day! The 14th annual Routes Europe forum will allow European airports to meet with key airline decision-makers from across the world, to develop existing relationships and forge new connections with some of the most influential aviation professionals in the world, while discovering the wider area’s beauty, business potential and tourism offerings. Hannover Airport hopes to use the event as an opportunity to convince airlines of the airport’s advantages and show them how the airport offers the ideal conditions for creating and conducting reliable and economical flight operations. Dr Raoul Hille, CEO of Hannover Airport said “Global top decision-makers will be convinced of the market prospects of our region and of our outstanding infrastructure. These are important stimuli for future decisions on routes. New routes which have not previously been offered from Hannover Airport are the main goal for the host team, with their eyes on the North American and Asian markets too, in addition to extending their European network. 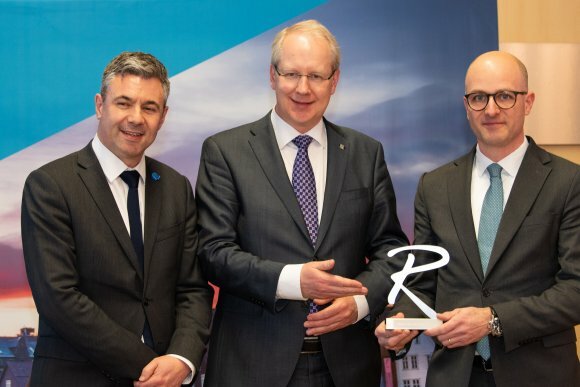 Steven Small, brand director of Routes, said “We are delighted to be uniting the region’s route development community here in Hannover at the heart of Europe. 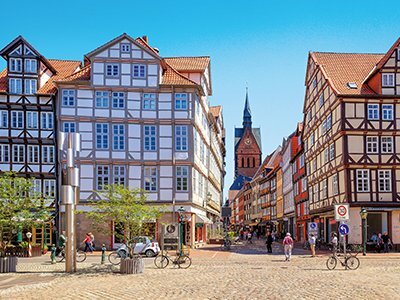 The city is a hidden gem which is home to some of the biggest global players from across the automotive, energy, science, technology and logistics industries, and its airport currently serves one of the widest and most powerful catchment areas in Germany. 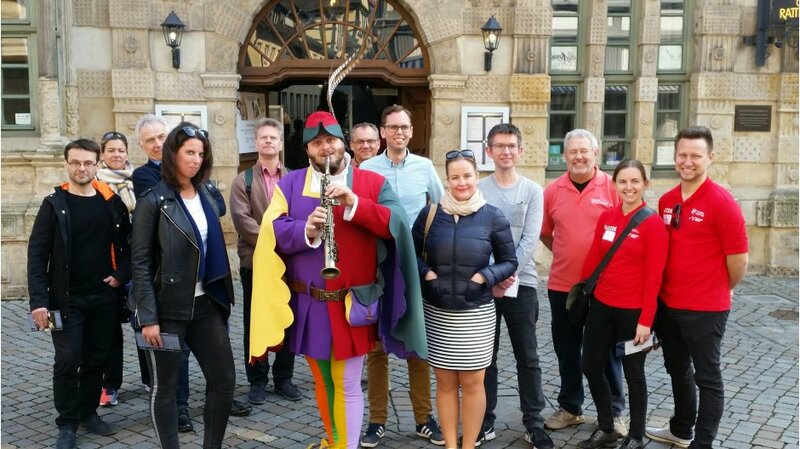 About 15 delegates were led a merry dance when they took a free tour of the nearby historical Hamelin. Taking a coach from Hannover, the group found out all about the town which is famous for the story about the Pied Piper who cleared the town of rats and then children after the townsfolk refused to pay the agreed price. The tour was one of eight free tours and events on offer both before and after Routes Europe and was organised by the hosts. A team of six members of Routes staff were among the 20,000 runners taking part in the annual HAJ Hannover Marathon this weekend. The event, which featured races over the marathon, half marathon and 10km distance, started at 9am on Sunday, attracted thousands of spectators around the 42.195km course. It began and ended in front of the spectacular New Town Hall and took in some of the city’s most impressive sites, including the Herrenhausen Gardens. With numerous samba bands and musicians accompanying the athletes along their run through the city, there was a real feel-good atmosphere for runners and spectators alike. The team from Routes participating in the 10km race featured brand director Steven Small, alongside Tom Atkinson, Mark Bassarab, David Casey, Paige Floyd and Kirsty Studholme. Together the team were raising money for Alder Hey Children’s Charity, which supports Alder Hey Children’s Hospital in Liverpool. The hospital cares for more than 275,000 children and young people each and every year. Throughout 2019, the Routes team have a target of raising £35,000 to fit out a 4D fully immersive distraction treatment room at Alder Hey Children’s Hospital. The room will contribute significantly to the wellbeing and comfort of its young patients as they undergo treatments and examinations, like extensive cardiac scans. Please visit our JustGiving page if you would like to donate to this incredible cause. 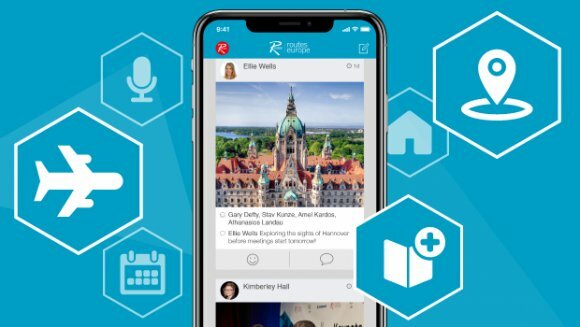 Sponsored by Tallinn Airport, the Routes app is an efficient platform for attendees to engage with their industry peers and find out the latest news and activity at Routes Europe. Updated with all the latest event information, the app serves as an indispensable tool for accessing event information, including official event locations, transfers and full delegate, sponsor and exhibitor listings. It also provides conference speaker profiles, as well as a live news feed, the event floorplan and much more. Available on iOS, Android and in HTML5 format, the Routes app is only available to those who have registered for Routes Europe 2019, with users requiring a unique email address and PRC. For more information about the app, please visit our dedicated webpage, or email Kimberley Hall if you experience any difficulties logging in. Delegates are able to collect their event badges ahead of the event opening from 13:00 – 16:00 at the Kastens Hotel. View the full event programme for more information and see our top tips to help you prepare for Routes Europe. 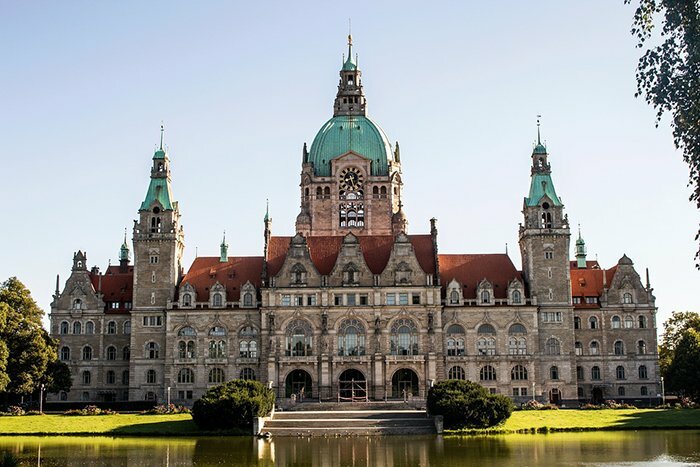 Hannover is the capital of the Lower Saxony state and has one of the largest catchment areas in Germany, with about four million people inhabiting an area covering 19,000 sq km. The city’s airport enjoyed a record year in 2018, with more than 6.3 million passengers passing through its terminals. The figure was a 7.7 percent increase on the previous 12 months, which was in turn 8.5 percent higher than 2016. As the only airport in Northern Germany operating 24 hours a day, airlines can therefore target an enormous market. 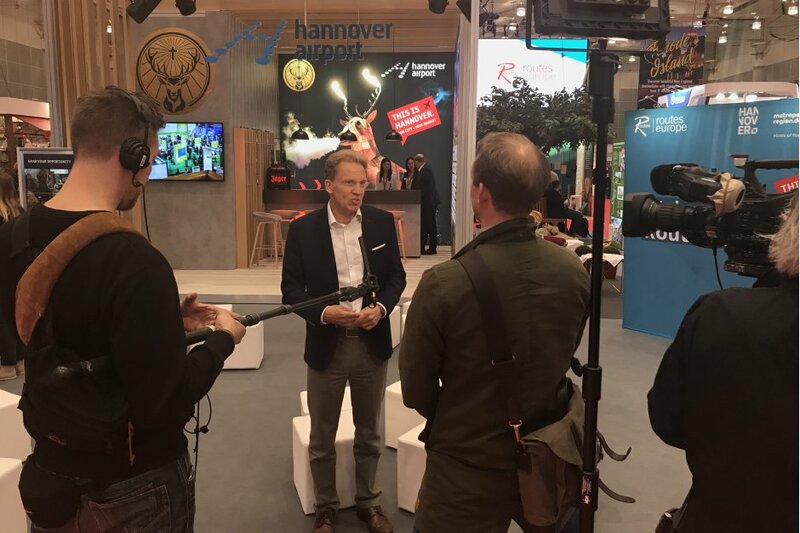 “As traffic hub in the heart of Lower Saxony, Hannover Airport plays an important role for both the business as well as the leisure tourism here,” says Hans Christian Nolte, the managing director of Hannover Marketing und Tourismus. “Also the nationally and internationally popular holiday destinations at the North Sea Coast, in the Lüneburger Heide or in the Harz Mountains can be reached easily and quickly via the hub airport Hannover. Hannover Airport hopes to use Routes Europe 2019 as a springboard to add new European short-haul routes and increase frequencies of existing ones, as well as expanding its long-haul network with services to North America and Asia. According to figures from OAG Schedules Analyser, the city will be connected to 80 international destinations during the summer 2019 schedule, with services to Palma de Mallorca, Antalya and Zurich set to be its top three busiest routes by flight frequency. 10.00 - The marathon is underway - support the Routes team! 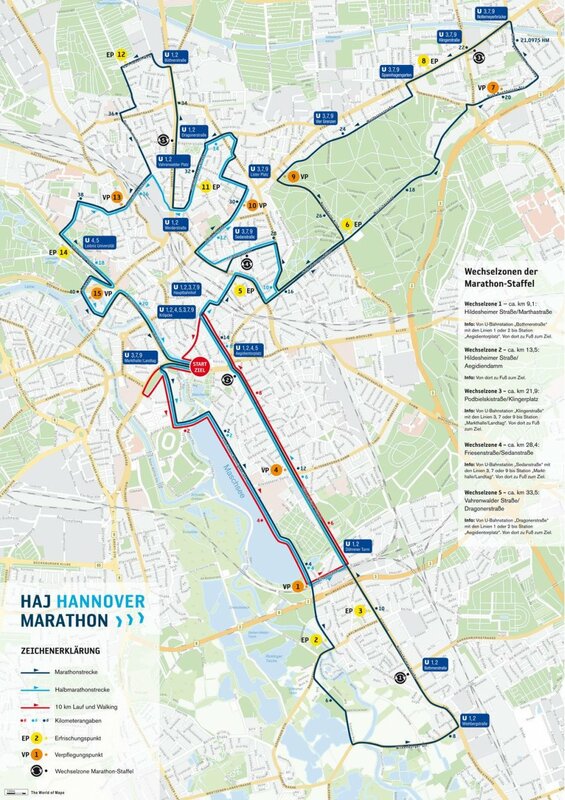 The HAJ Hannover Marathon is an annual road running event featuring races over the marathon, half marathon and 10km. More than 25,000 people are expected to take part this year! Are you watching or participating? Share your photos on Twitter using the #RoutesEurope hashtag and on the app. Routes has a team running in the 10km race this afternoon, raising money for Alder Hey Children's Charity. The charity funds life-saving medical research into childhood conditions. Alder Hey Children's Charity is aiming to fit out 15 treatment rooms with state-of-the-art immersive distraction technology which is proven to reduce sedatives, anxiety and pain in children. Fitting our treatment rooms with distraction equipment works and is proven to reduce the need for sedation by 40 percent, meaning children are not exposed to unnecessary medication and staff can treat more children each day. However, each room costs up to £35,000 to fit out and the hospital currently has just two specially adapted rooms. Find out more about this worthy cause and how you can support the Routes team! 09.00 - Welcome to Hannover! 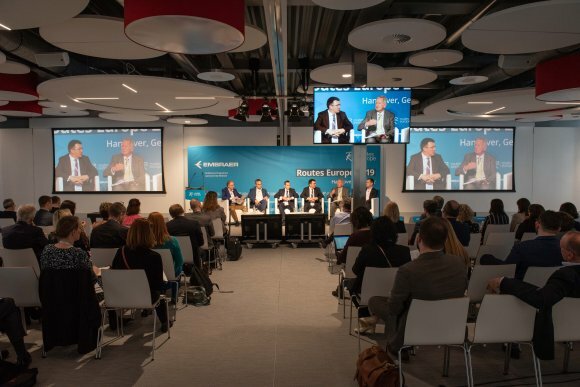 The 14th annual Routes Europe gets underway in Hannover tomorrow (8 April 2019), bringing together airlines, airports and tourism authorities from across the region to discuss and develop air route networks. With 45 meeting slots and unlimited networking opportunities, this event will allow you to engage in business-focused discussions with Europe's key decision makers. Delegates will take part in more than 2,500 face-to-face meetings to discuss new and existing air services. Are you among the attendees? Share your journey to Hannover on Twitter using the #RoutesEurope hashtag and on the Routes app.